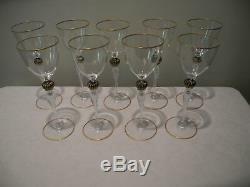 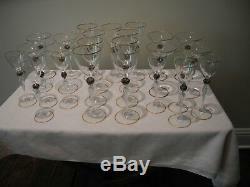 Fantastic 24+ hand blown Venetian glass set, (8 each, plus 1 extra Water) 8 original wine glass - goblet - claret - APPROX. 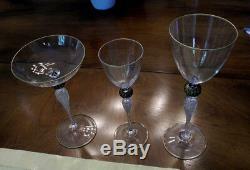 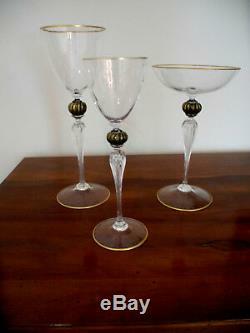 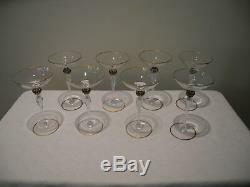 MEASURE: 8 3/4" HIGH by 2 3/4" DIAMETER ACROSS RIM by 3 1/2 D BASE 9 original TALL water goblets - APPROX. 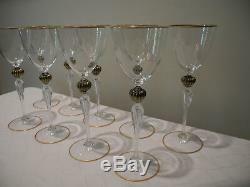 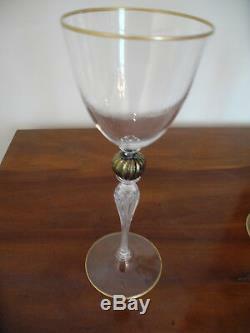 MEASURE: 10 1/4" HIGH by 3 1/2" DIAMETER ACROSS RIM by 3 1/2 D BASE 8 Italian Champagne Goblet - APPROX. 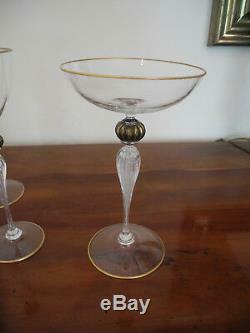 MEASURE: 8 1/4" HIGH by 4 7/8" DIAMETER ACROSS RIM by 3 1/2 D BASE All made in Venice and brought over in the 1950's by current and original owner. 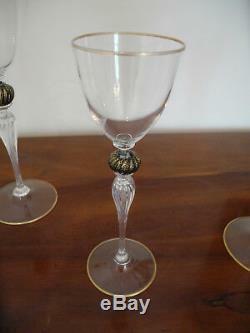 Yes, 1 original owner very carefully cared for, seldom used. 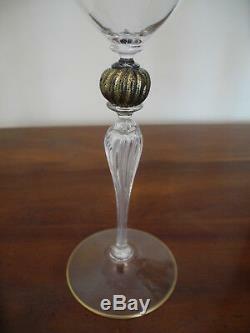 BLOWN VENETIAN MURANO ITALIAN GOLDEN RIMMED ART GLASS WINE/WATER GOBLETS WITH FULL HOLLOW BLACK AND GOLD BALL TWIST, BLOWN HOLLOW RIBBED STEM CLASSICAL CONICAL GOBLET FORM AND BASE ELEGANTLY SHAPED AND BEAUTIFULLY BALANCED glass feels wonderful and perfectly weighted to hold in your hands STUNNING BEAUTIFULLY APPLIED RIBBED TWIST BALL CONNECTOR, GOLD RIMMED STEM AND BASE. 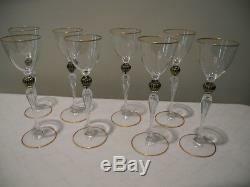 The item "Set of 24 Venetian Murano Black/Gold bulb, Water WIne Champagne 8 each NICE" is in sale since Tuesday, September 12, 2017.